IT administrators and IT support staff need easier access to key information about software and operating system deployments, client health, and compliance with regulations. They must ensure that their systems and software meet the configuration requirements established for the organization. And they need the ability to track this information without having access to a System Center Configuration Manager console. The Microsoft System Center Configuration Manager 2007 Dashboard lets customers track application and operating system deployments, security updates, the health status of computers, and IT compliance with key regulations—with an easy to use, customizable Web interface. Because the Dashboard is built on Windows® SharePoint® Services, IT staff can access information without using the Configuration Manager console. The Dashboard is a free Solution Accelerator, and fully supported by Microsoft. Actionable information out of the box. The dashboard comes with valuable, built-in datasets that IT managers can access without using the Configuration Manager console. Centralized, near-real-time access to key information. The graphical dashboard lets customers view any Configuration Manager data set in near-real time—without leaving their desk. Easy to customize. The dashboard can easily be customized to meet the needs of different departments and other groups. Any data set in the Configuration Manager database can be presented on the dashboard, in chart, gauge, and table formats. The Configuration Manager 2007 Dashboard is globalized, but not localized to non-English languages. Currently it is only supported for US-English language. The Configuration Manager Dashboard is designed to work with an existing Configuration Manager 2007 infrastructure. The Dashboard queries the Configuration Manager site database and uses the resulting data set to present key infrastructure metrics in a graphical format. Microsoft Dashboard Configuration Web Part. Use this Web part to create and modify the SQL queries that produce the data sets and the other properties that govern how the Dashboard displays the data sets. Microsoft Dashboard Viewer Web Part. Use this Web part to display the data sets. A Dashboard Viewer Web Part displays one data set at a time. The Configuration Manager Dashboard can contain multiple copies of the Dashboard Viewer Web Part at once, each copy displaying a different data set. The following figure shows how users can interact with the Web parts to retrieve and display data. An IT Service Manager requests a new data set. The IT Administrator uses the Dashboard Configuration Web Part to define the new data set. The IT Administrator stores the configuration information for the new data set (the information is saved in the Windows SharePoint Services Content database). The IT Administrator adds a new copy of the Dashboard Viewer Web Part to the default Configuration Manager Dashboard and then modifies the Web part to display the new data set. The IT Service Manager browses to the Configuration Manager Dashboard site. 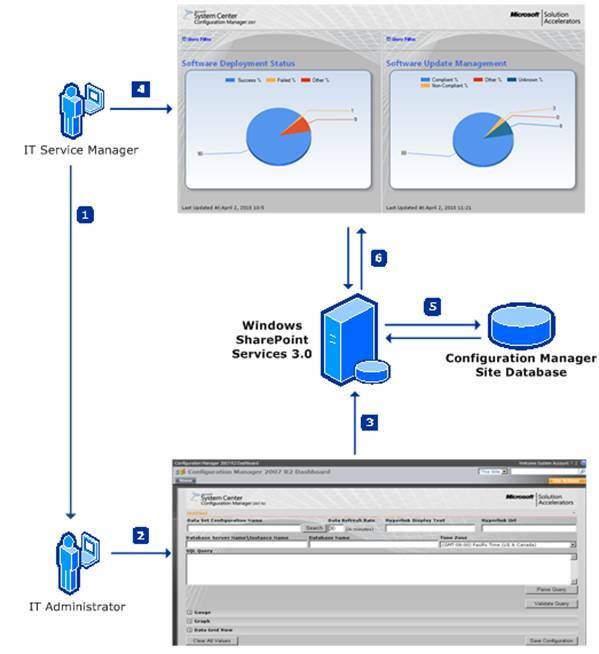 Windows SharePoint Services queries the Configuration Manager site database as specified by the data set configuration. Windows SharePoint Services renders the new data set using the Dashboard Viewer Web Part. The Configuration Manager Dashboard integrates with an already functioning deployment of System Center Configuration Manager 2007 and has no additional infrastructure requirements. It is assumed that Configuration Manager 2007 and the Configuration Manager site database are configured in accordance with Microsoft installation guidance. The following table lists software requirements for the Configuration Manager Dashboard. Note For more information about the software requirements for the Configuration Manager Dashboard, see the appropriate sections in the System Center Configuration Manager 2007 Dashboard: User Guide or the System Center Configuration Manager 2007 Dashboard release notes. Please send questions or comments about this Solution Accelerator to satdash@microsoft.com.